On Friday, 22 March, in the euro auction ended with the fall by 0.64% for the week - 0.21%. During Thursday and Friday shoppers have lost all the profits, which they saw in the first half of the week. On the last day of the week the euro came under pressure due to weak data on business activity in the manufacturing sector in Germany. Activity in the manufacturing sector showed the lowest since June 2013. Euro together with the collapse of the Turkish lira caused the flight from risky assets. The British, in turn, strengthened against the dollar due to the fall of the EUR / GBP pair. In addition, more than 5 million people in Britain have signed a petition calling for the UK to abandon the exit from the EU. The Times writes that even the allies call Mei decide quickly with the resignation date. If the rumors are true resignation May, the pound will rise by 2-3 figures. At 12:00 Germany will publish the indicator conditions business environment from IFO, an indicator of the current situation from the IFO, the indicator of economic expectations from IFO for March. At 12:30 a speech made by members of the ECB Ker. At 13:00 a speech made by members of FOMC Harker. After overlapping the upward movement from 1.1326 to 1.1448 on Friday saw the correctional movement just above the 45th degree and keeping prices above 1.1345 at least until Monday. Weak German PMI in the manufacturing sector greatly weakened the position of buyers, many traders decided to get out of longs. Falling EURUSD pair of points was 119 or 1.04%. Distance from lb to D3. 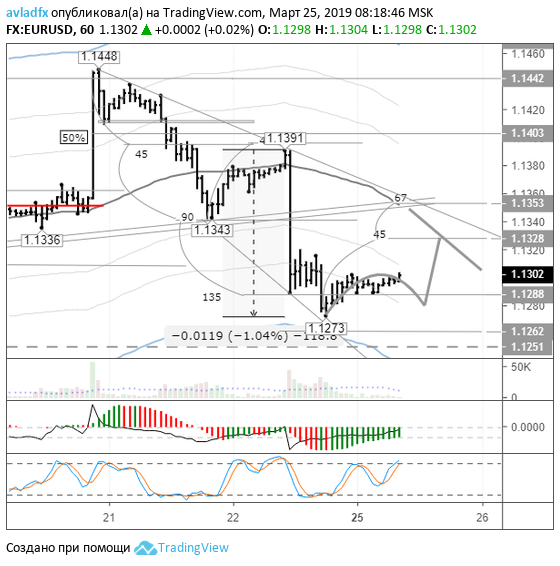 Because of 1.1273 there was a sharp rebound in the current situation, we can expect the formation of another low or double bottom. And then, at the moment, the growth should be seen as a correction to fall from 1.1448. Weekly bearish bar closed body with a long upper shadow. As the weeks bearish trend lasts from mid-February 2018, these candles sellers use for opening new short positions on the euro. To neutralize it, customers need to consolidate above 1.1365 to the environment. The faster the better. According to the forecast EURUSD upward correction today - Monday against Friday. Level 1.1338 (45 c and lb) protrudes resistance. The trend line from 1.1438 to 15:00 (GMT + 3) will pass through 1.1345.